Rare 15th-century Ming Xuande porcelain sprinkler, est. $250,000-$350,000. I.M. Chait image. BEVERLY HILLS, Calif. – When the doors are opened to I.M. Chait’s elegant Manhattan gallery space during Asia Week New York (March 16-24), the management and staff of the family-owned southern California firm expect to welcome many old friends to their preview and March 21 auction of Important Chinese Ceramics & Asian Works of Art. The company’s venerable founder and auctioneer Isadore “I.M.” Chait, who is celebrating his 45th year as a specialist dealer of Asian art, takes pride in the fact that collectors who bought from him decades ago are still amongst his active clientele. But what is changing, Chait said, is that nowadays there are so many private museums establishing or adding to their Asian collections, that many rare pieces are being removed from the cycle. “They’re going into institutional collections and staying there. This is one factor that is driving auction prices upward,” Chait said. Mark on the Ming Xuande porcelain sprinkler. I.M. Chait image. There are many rare and exotic artworks in the 300+ lot March 21 auction that Chait predicts will attract intense interest. Topping the list is a marked 15th century Ming Xuande Period porcelain sprinkler of Islamic shape. Chait explained that, at the height of its manufacture, Chinese porcelain often went to Middle Eastern potentates, hence the distinctive bulbous style with graduated cylindrical spout. “Anything from the 15th century is exceedingly rare. This sprinkler comes from a major collection that was started 35 to 40 years ago. The only reason this piece is being sold is because the consignor is fortunate enough to have another one in their collection,” Chait said. Yuan Dynasty blue and white porcelain bowl, est. $120,000-$150,000. I.M. Chait image. Another highlight with a six-figure estimate is the Yuan Dynasty blue and white porcelain bowl with expectations of reaching $120,000-$150,000. The bowl comes to auction with outstanding provenance, having once been part of the renowned T.T. Tsui Museum of Art Collection in Hong Kong. An estate collection local to the auctioneer’s Beverly Hills gallery was the source for an important spinach jade brushpot that Chait describes as “one of the most exquisitely carved brushpots we’ve ever seen.” Under its base is a label – possibly from the 1960s/’70s – from the London auction house Spink & Son. Important spinach jade brushpot, est. $40,000-$50,000. I.M. Chait image. Chait noted that the object is deeply and intricately carved from a single piece of jade, a method that requires great artistic skill. The carver’s technique masterfully rendered a three-dimensional, “layered” effect to the piece. The presale estimate has been set at $40,000-$50,000. The rich cobalt hue of lapis lazuli is the immediate focal point of a Qianlong table screen from an old Shanghai collection. According to Chait, it may have Imperial provenance. 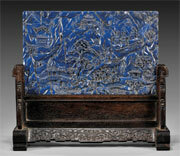 Qianlong lapis lazuli table screen, est. $35,000-$40,000. I.M. Chait image. “Most table screens of this type are made of wood. Lapis is more rare,” he said. The lot is estimated at $35,000-$40,000. Additional objects of exceptional quality are still arriving for consignment to Chait’s Asia Week auction, including a collection of 70 extremely fine 20th-century netsukes, most being of ivory and all by important carvers. The collection was purchased at auctions and from top dealers in the 1990s, bearing out Isadore Chait’s theory about a 20-year buying-and-reselling cycle. 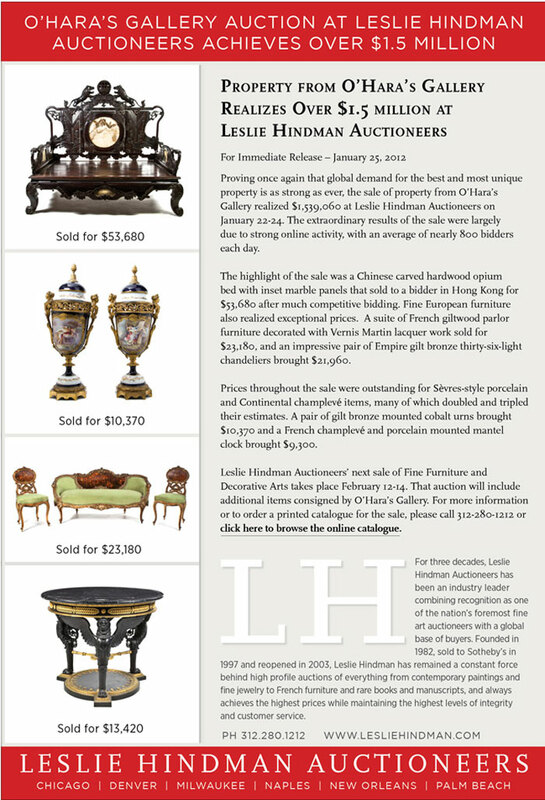 Chait’s Asia Week auction is the firm’s most important sale of the year. Each object selected for inclusion in this year’s premier event was personally selected and vetted by Isadore Chait and comes with the company’s guarantee of authenticity. 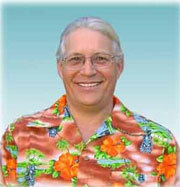 Mr. Chait is an internationally acknowledged expert in both Oriental sculpture and gemology. He is a recommended appraiser to many museums and educational institutions, including the J. Paul Getty Museum, the Norton Simon Museum and the Los Angeles County Museum of Art. All auction items will be available to preview daily from March 16-20, 10 a.m. to 5 p.m. (10 a.m. till noon on auction day) at I.M. Chait’s gallery on the 6th floor of the historic Fuller Building, 595 Madison Ave. at 57th St., New York, NY 10022. A West Coast preview will take place from Feb. 27-March 4, from 11 a.m. to 5 p.m. or by appointment, at I.M. Chait’s flagship gallery located at 9330 Civic Center Dr., Beverly Hills, CA 90210. The March 21 Asia Week New York auction will commence at 2 p.m. Eastern Time at the Fuller Building gallery, with all forms of bidding available, including live via the Internet through LiveAuctioneers.com. Four of I.M. Chait’s staff are fluent in Mandarin and will be on hand to greet Asian visitors to the New York gallery space and to assist Chinese-speaking bidders over the phone during the auction. 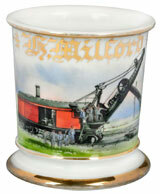 Antique occupational shaving mug with image of railway steam shovel, est. $2,000-$2,500. Morphy Auctions image. DENVER, Pa. – Some say chivalry is dead, but Dan Morphy says “Nay, verily.” Morphy’s central Pennsylvania auction gallery will soon be the setting for an auction of antique helmets, swords and other metal weaponry that even Sir Lancelot might be tempted to bid on. The 40-lot grouping of armor is one of several collections featured in Morphy’s Feb. 24-25 General Antiques auction, along with Tiffany silver, early telephones, antique American firearms, jewelry and watches. Day one of Morphy’s 1,350-lot auction – a Friday session – will open with 150 occupational shaving mugs from the 19th and early 20th centuries. Among the top lots in this grouping are mugs with images of a railway steam shovel, estimate $2,000-$2,500; and a fire truck with the word “Liberty,” est. $1,000-$1,500. A particularly rare mug has a photographic image of its owner, identified as “W.I. Xander.” Est. $1,000-$1,500. The 100 automobilia lots to follow include a number of early 20th-century French posters, as well as Royal Doulton and Nippon pottery with motoring themes. There are six pieces of Roseville in a pattern featuring touring cars, with a jardinière estimated at $2,000-$3,000; and a flared vase, $1,500-$2,500. Extremely rare Roseville 8-color Della Robbia vase designed by Frederick Hurten Rhead (1880-1942), 20 in. tall, est. $10,000-$15,000. Morphy Auctions image. An additional 100 lots of general pottery feature Roseville, Rookwood and Weller. Highlights include an eight-color Roseville Della Robbia vase designed by Frederick Hurten Rhead (1880-1942), $10,000-$15,000; and a Weller Louwelsa American Indian portrait vase, signed “A. Williams” and estimated at $3,000-$3,500. An extensive selection of fine jewelry has been cataloged, with top lots led by a highly decorative 14K gold bridal belt, circa 1920s and weighing 578 grams, est. $20,000-$30,000. A trove of bracelets, necklaces, pendants and rings of very high gold content will be offered, including a heavy “statement” ring with a lion’s-head motif that is expected to make $18,000-$22,000. Weighing 171 grams, an 18K gold enameled ladies’ compact carries an estimate of $7,000-$9,000. From the private vault collection of retired Florida jewelers comes an array of fine wristwatches by prestigious Swiss watchmakers. Patek Philippe, Juvenia and Rolex models from the 1930s through 1950s are included, as are numerous pocket watches and several 18K gold repeaters with individual estimates of $2,500-$3,500. From the Bill Daniels collection – Part II, circa-1904 silver dollar pay station telephone manufactured by the Gray Co., walnut with Western Electric ‘pony’ receiver, est. $5,000-$7,000. Morphy Auctions image. The Saturday session will begin with Part II of the late Bill Daniels’ collection of antique and vintage telephones. Highlights from the more than 200 lots to be auctioned include a circa-1878 Charles Williams “coffin” telephone, $5,000-$10,000; an 1895 Western Electric folding vanity telephone, $3,000-$4,000; and a circa-1904 pay station phone that operates on silver dollars, $5,000-$7,000. The collection also includes telephone-related porcelain signs and other great advertising pieces. The featured collection of antique armor was amassed over a period of 50+ years by renowned Hollywood animator and film director Frank Andrina. The most imposing item in the collection is a suit of full standing armor, with most of its composite pieces dating to around 1560. Standing approximately 75 inches tall, the suit is in very good to excellent condition. It is expected to sell in the $30,000-$50,000 range. A favorite sword in the Andrina collection is a circa-1580 German production with flambé blade and deeply stamped haft. One side of the handle is marked “SDIOSDI,” while the other bears the sacred “IHS” monogram. The 75-inch-long sword could fetch $10,000-$15,000. Constructed entirely of hand-forged steel, a circa-16th-century mace incorporates six unusual arrowhead-spiked flanges. Each flange features the touch mark of a shield with cross and the initials “H.K.” Nicely laminated throughout, it carries an estimate of $4,000-$8,000. Circa-1630 Italian or German Savoyard-style helmet with two-piece skull, low comb and two-piece visor. Estimate $4,000-$8,000. Morphy Auctions image. two-piece visor. The helmet retains the majority of its blackened finish and displays two small period restorations. Estimate: $4,000-$8,000. From armor and swords, the sale moves into a grouping of 100+ vintage firearms, including more than a dozen prized Kentucky rifles. Leonard Reedy Kentucky rifle made in the first or second quarter of the 19th century, untouched and all original. Estimate $20,000-$40,000. Morphy Auctions image. Colt Lightning Model 1877 gun with original papers. Estimate $7,500-$15,000. Morphy Auctions image. In addition to the Kentucky rifles, Morphy’s Feb. 24-25 sale includes a nice selection of Springfield bolt-action rifles, a Colt Lightning Model 1877 with original papers, est. $7,500-$15,000; and a Philadelphia Derringer with ivory grip, est. $3,500-$5,000. Additionally, there are numerous other shotguns, muskets and pistols; as well as more-contemporary entries. The session continues with several lots of folk art, led by two circa-1870s Brubaker carved wood horses, $10,000-$15,000 pr. ; a five-color stoneware water cooler with a Niagara Falls scene, $4,000-$6,000; and more than 100 figural napkin rings. Designs include Kate Greenaway designs – two girls on ladder, and lady on toboggan – and a giraffe under a palm tree. Each is estimated at $1,500-$2,000. From a superb selection of extensively chased and embossed Tiffany & Co. silver, a pair of circa-1882 nine-light candelabra with triton, seahorse and mermaid motif, est. $40,000-$60,000; and a pair of circa-1882 center bowls, est. $40,000-$60,000. Morphy Auctions image. Two consecutive lots feature exquisite pieces from Tiffany & Co., all dating to around 1882. A pair of elegant 16-inch-tall candelabra are extensively chased and embossed with rocaille work and seaweed – one with tritons and seahorses; the other with mermaids. Each candelabrum features nine tentacle-like candle arms terminating in sockets with removable drip pans. The pair will be offered together with a $40,000-$60,000 estimate. Two circa-1882 Tiffany silver center bowls are decorated similarly to the candelabra, with extensive chasing and embossing, and swirling seaweed and rocaille work. The triton-theme bowl weighs 80 oz., as does the bowl with the mermaid motif. Their liners weigh 23.5 oz. and 24 oz., respectively. These spectacular bowls are expected to fetch $40,000-$60,000 the pair. Another highlight is a circa-1899 Gorham martele silver water pitcher. Originally retailed by the Chicago jewelers Spaulding & Co., the vessel is entered in the sale with a $10,000-$15,000 estimate. Both the Feb. 24 and Feb. 25 auction sessions will commence at 10 a.m. Eastern Time. All forms of bidding will be available, including live via the Internet through Morphy Live or LiveAuctioneers.com. View the fully illustrated catalog online at www.morphyauctions.com or www.liveauctioneers.com. For additional information, call 717-335-3435 or e-mail serena@morphyauctions.com. But no one knew the disasters of nature and history that the twice-yearly show would face for its first 30 shows over the last 15 years. On Tuesday April 3 through Saturday April 7, 2012, the 30th edition of the Marburger Farm Antique Show will feature over 350 national and international exhibitors, with a crowd of shoppers from across the US and around the world. “Through rain, sleet, snow or 100 degree weather, here they come,” says Tallahassee, FL exhibitor Carol O’Steen. She could have added: through 9/11, through Hurricanes Katrina and Ike, when gas hit $5, when the banks melted down, through two wars and with one show opening in the worst week in the US economy in generations. Why has the Marburger Farm Antique Show been able to flourish during such a difficult era in America? Judy Hill of J Hill Designs agrees. “It takes strong people to create something that gives other people an outlet in the face of disasters. Antique shows are a stress reliever. We are a community, an antiques community. We love to be together and we love what we do. We love the people who come because we all have this in common: we connect over antiques. I don’t even call them customers. They are people who love the same things that I do.” Hill will offer “soft industrial” antiques in metal and wood, plus an arbor and other garden antiques, with lots of white for a spring palette. Michael Roberts of Roberts Antiques in Homer, MI lifts up the customer-friendly vibe at Marburger Farm. “We do shows all over America and Marburger Farm is the only place that is consistent, show in, show out. Parking is easy, not a lot of hassle. And Marburger has something for everyone. We have a wide price range.” Roberts will alight in Texas with antiques from France and Italy, plus art, garden antiques, lighting and wicker. There are other reasons for the success of the Marburger Farm Antique Show: the overflowing booth spaces that allow more space for so much more merchandise than at other shows; the long three day set up that gives dealers the time to bring in this unusually massive amount of merchandise. Then there are those stunning booth displays that are now the norm at Marburger Farm. And then there is that strong Texas economy and all those store owners…interior designers…and moms and dads and kids and multiple generations who enjoy being together in the midst of antiques, history and beauty. And who enjoy Marburger cupcakes. Why does Marburger Farm flourish? Lowell Dunn, Canterbury Court, Corsicana, TX echoes the theme: “It’s the excellent mix and quality of the antiques. Even with all that goes on in the world, people still want comfortable homes and to be surrounded with things that they love. That’s what Marburger Farm dealers offer.” Dunn takes great effort to offer it, traveling to England to unearth pottery, Staffordshire, majolica and furniture with an English country home style. So come to the Marburger Farm Antique Show this spring and help celebrate our 30th show. We’ll have a full-service cafe, endless supplies of ice tea and lemonade, wi-fi, air-conditioned restrooms, daily cash drawings, cold beer and frozen “Marburitas.” And, if our luck holds out, we’ll also have bluebonnets. The Marburger Farm Antique Show opens for Early Buying with $25 admission on Tuesday April 3 from 10 am through 2 pm, when regular $10 admission begins. One admission is good all week, with the show running on Wednesday, Thursday and Friday from 9 am to 5 pm and on Saturday, April 7, from 9 am to 4 pm. Advance tickets and group tickets are available. Antiques, vintage and artisan creations will include American, French, English, Continental, architectural, fine art, jewelry, textiles, mid-century modern, silver, western, garden, painted furniture, early Texas and more. A portion of the spring show proceeds will benefit the Texas Children’s Hospital. Parking is free and admission is free for children 15 and under. Dogs on a leash are always welcome. See information on vendors, the new Marburger Farm mobile app, travel, maps, lodging, on-site shipping and special events at www.roundtop-marburger.com or call Rick McConn at 800-999-2148 or Ashley Ferguson at 800-947-5799. This MoPac (Missouri Pacific) railroad lantern with ruby-colored glass is one of approximately 160 lanterns from various train lines in the Roy Gay collection. A&S image. WACO, Texas – There is no more enduring symbol of how the Old West became part of the New World than the American railroad, with its steam-powered “iron horses” that linked East to West. It is the lifelong fascination with early trains and the culture that surrounded them that inspired the late Roy Gay’s 65-year collection of railroadiana, which will be auctioned in its entirety on March 10-11. A&S Antique Auction Co., specialists in Western Americana, will conduct the sale of the approximately 2,000-piece single-owner collection at its Waco, Texas gallery, with Internet live bidding through LiveAuctioneers.com. “Mr. Gay, who passed away on January 11th of this year, gave his whole working life of 40-plus years to the Union Pacific Railroad. He was an auditor for the company and traveled a three-state region in the course of his job, so that opened all the necessary doors to acquire railroad relics. When a depot closed down, he would know about it and be in a position to buy the pieces he wanted,” said A&S’s owner Scott Franks. Roy Gay’s collection of lanterns, railroad advertising signs, tableware, tinware, whiskey crocks and literally anything else that would have been part of a train journey from the late 19th- through mid-20th centuries grew to such size that an unusual step was taken. Most of the items Gay collected are from the “golden era” of railroads – the 1880s through middle “teens” – with a smattering of later objects whose timeline ends around the 1970s. Railroad sign whose design was in use from 1890-1930 to advertise MKT (Missouri-Kansas-Texas Lines), one of a multitude of signs in Roy Gay collection. A&S image. The Waco auction gallery’s walls are a spectacle to behold with the massive sub-collection of approximately 160 railroad lanterns now on display. Many of the lanterns have green, ruby and amber colored glass panels; while a few were made with richly hued cobalt-blue glass. 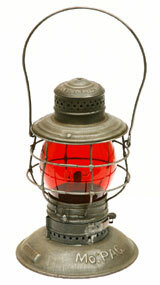 Franks noted that most are signal or switch-type lanterns made by Dietz or other manufacturers. Each is marked with the name of an American railroad. Additionally, there are some very scarce inspectors lanterns with matching IDs on the casing and globe components, and one particularly rare presentation lantern. The grouping also includes many as eight brass firemen’s lanterns, which have a distinctive shape and large, rolled handles that prevented the user’s hands from getting burned. Selection of blue and white historical-pattern china used in dining cars on the B&O (Baltimore & Ohio) line. A&S image. Franks predicts crossover competition from antique advertising collectors for the scores of old railroad signs in the Gay collection. Highlights include a beautiful, all-original circa 1890-1930 MKT porcelain sign, conservatively estimated at $2,000-$3,000; and a 36-inch-diameter “buzzsaw” sign, referring to its serrated edges, which advertises Texas Pacific Lines on one side and Missouri Pacific on the other. Franks explained that the sign would be flipped over when a train crossed a state line where one or the other of the companies had jurisdiction. A vast array of railroad tableware incorporates 200-300 pieces of marked china, including a rare dinner plate for the Great Northern Iron Mountain Route’s Sunshine Special, estimate $2,000-$3,000. Other railroad china comes from Missouri Pacific (including service plates), Texas Pacific, MKT, NY Central, Union Pacific and Southern Pacific. 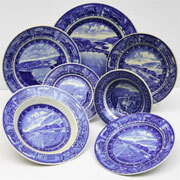 Additionally, there is a large assortment of blue china in B&O’s historical pattern. Other food service goods include silver flatware and covered wares marked for dining cars or railroad companies; table linens, 65 railroad-marked sugar tongs, 2-cup pitchers for tea or coffee, creamers, sugar bowls, covered bowls, carafes, pedestaled dessert dishes, and salt and pepper sets. 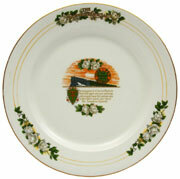 The late Roy Gay prized this beautiful plate from the Great Northern Railroad’s Sunshine Special above all other china in his vast collection. A&S image. Every train had a galley where beverages and other liquids were stored in crocks. One- and 2-gallon examples marked with railroad names are part of the Gay collection, as are more than 100 crocks marked for brands of whiskey and other alcoholic beverages; saloons and taverns. Decks of cards in the Roy Gay collection include this rare pack advertising the St. Louis Southwestern Railway’s Cotton Belt Route. A&S image. Many items kept train passengers occupied on long journeys of a century ago, and nearly all were marked with the names of particular railroads. Among the convenience articles to be auctioned are ashtrays, playing cards (some with an African-American theme), dozens of paper hand fans with advertising, blankets and numerous cast-iron footstools that ladies and children would step onto when boarding a train. Manly metal from the steam-train era will be front and center on auction day, with such contents as railroad-branded locomotive engine bells, spittoons, and brass railroad locks and keys; plus an extremely rare cast-iron stove made by Hart Mfg. of Louisville, Ky., and embossed with the word “Caboose.” Auctioneer Franks, who has handled numerous railroad items over the years, said it is the first of its type he has ever seen. 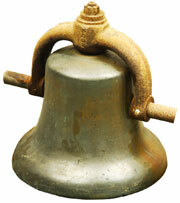 The ‘heavy metal’ section of the sale includes steam locomotive engine bells (as shown), spittoons, brass railroad locks and keys; plus an extremely rare cast-iron caboose stove. A&S image. Framed decorative artworks from train stations of a bygone era are led by a spectacular panoramic, shadowboxed wildlife photo titled “An Elk Lodge in the Jackson Hole Country Reached via the Union Pacific System.” Measuring 48 inches wide by 12 inches high, the circa-1920s picture was taken on the Steven N. Leek resort lodge and ranch, an elk refuge in Grand Teton National Park, Wyoming. Leek’s Lodge, which was listed on the National Register of Historic Places, was destroyed by fire in 1998. The auction offering contains many other desirable railroad mementos, such as caps from conductors, inspectors and engineers; railroad passes, railroad station thermometers that advertise train lines and various products, and 75-80 pieces of railroad-marked tinware for use with diesel cans and other containers. 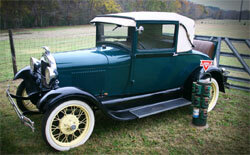 Roy Gay’s 1929 emerald green Model A with camel upholstery and rumble seat. A&S image. In addition to railroad antiques, the Roy Gay collection includes an extensive selection of early automobilia, 30 to 35 gas pump globes, an 8ft. Mobil Pegasus sign and other advertising; and even a beautiful emerald green 1929 Model A rumble-seat Ford. The car has always been garaged and is drivable. The March 10-11 auction will be held live at A&S Antique Auctions’ gallery, 900 E. Loop 340, Waco, TX 76716, and will start at 10 a.m. Central Time each day. 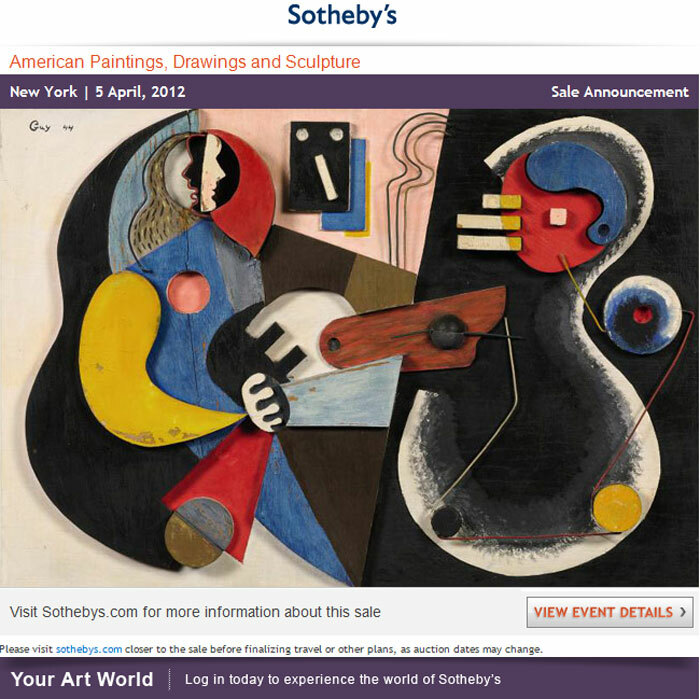 All forms of remote bidding will be available, including absentee, by phone or live via the Internet through LiveAuctioneers.com. For additional information call 254-799-6044 or e-mail asantiques@yahoo.com. Visit the A&S website at www.asauctions.com. 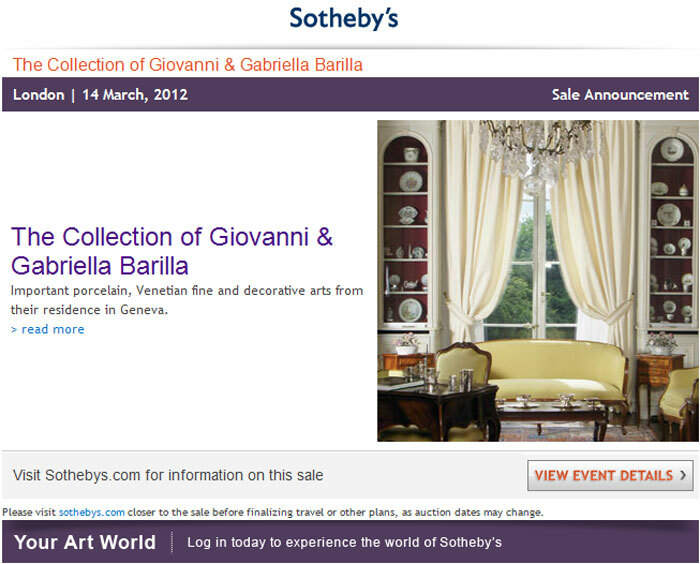 View the online catalog at www.LiveAuctioneers.com. From their Geneva residence, the collection of Giovanni and Gabriella Barilla, descendants of the famous dynasty of pasta makers, encompasses pieces for both the passionate and composed collector. Among one of the most important European collections of German and Italian porcelain, early Meissen by Böttger, Baroque commedia dell’arte figures by Kändler, and rare models and harlequins from the Wiessenfels group, mix happily with exceptional and very rare Capodimonte pieces, Buen Retiro, Vezzi and Fabrica Ferdinandea, Napoli groups and figures – altogether encapsulating the vibrance of ‘carnival’. Together with colourful Maiolica, Faenza and Della Robbia, these compliment and enrich the collection of elegant 18th century Venetian furniture and paintings, drawings, silver, works of art, books and 15th century manuscripts. 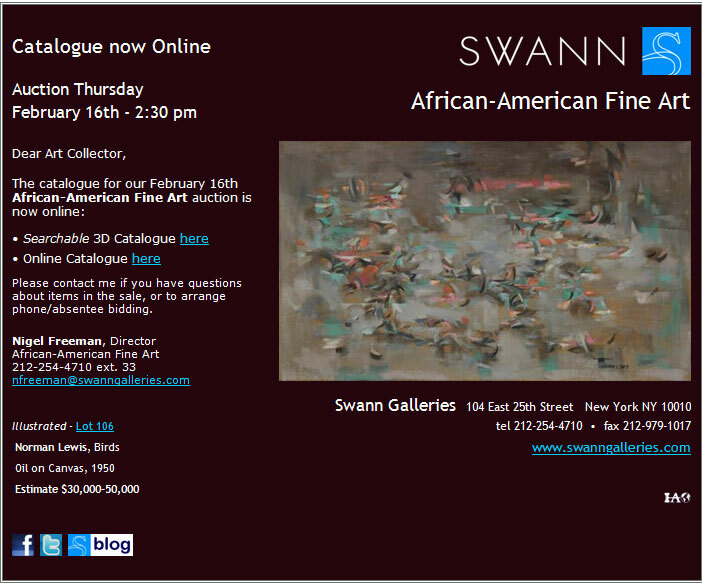 Sotheby’s is now accepting consignments through February 5th for the American Paintings, Drawings and Sculpture sale, to be held on April 5th, 2012. Proving once again that global demand for the best and most unique property is as strong as ever, the sale of property from O’Hara’s Gallery realized $1,539,060 at Leslie Hindman. Features the first William T. Williams painting to appear at auction, a monumental 1971 acrylic on canvas titled Eastern Star. HERSHEY, Pa – Organizers of the highly anticipated American Antique Toy & Coin-Op Show, just announced a new addition for the event that will allow attendees to bring their old toys to be appraised. Gary Sohmers, an expert in Pop Culture, Collectibles, Toys and Memorabilia, is scheduled to appear at the show to do Verbal Appraisal Values for Antiques and Collectibles, while occupying a 24 ft. by 8 ft. booth to display and sell merchandise, according to the show’s promoter, USA Theatres. 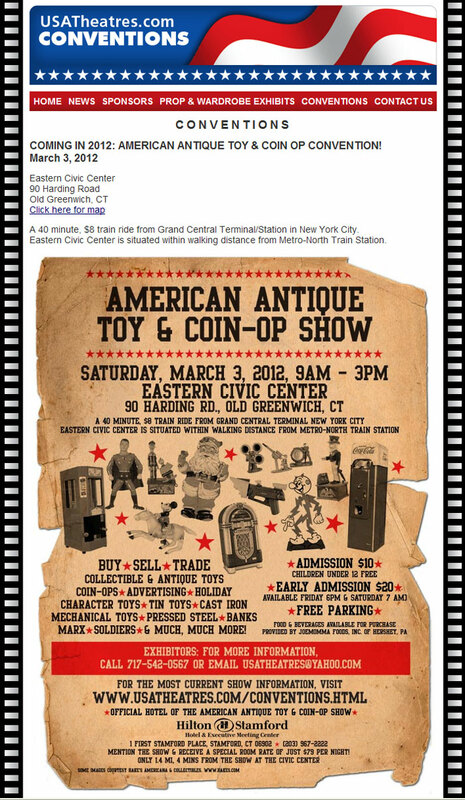 The American Antique Toy & Coin-Op Show is set to debut on Saturday, March 3, at the Eastern Civic Center, situated within walking distance from the Metro-North Train Station in Old Greenwich, Connecticut. According to USA Theatres, the show will feature quality exhibitors buying, selling and trading an array of antique and collectible toys, such as character toys, tin toys, mechanical toys, banks, trains, actions figures, diecast vehicles, games, model kits, advertising items, and coin-ops (jukeboxes, slot machines, etc…). Some of the high quality dealers who will be exhibiting at the inaugural show include Tom Miano, owner of Serious Toyz; Fred Franklin, owner of Rec Room Specialties; and Mike and Lauren Czajkowski, co-owners of Milo Toys & Collectables, to just name a few. Additional dealers from New York, New Jersey and Pennsylvania, who specialize in coin-operated machines and other related antique toys and collectibles, have responded to the show; including Dan Morphy, owner of Morphy Auctions, who is interested in utilizing 24 feet of exhibit space. A variety of food and beverages will be available for purchase at the show, provided by Joemomma Foods, Inc. of Hershey, Pa.
General admission into the show is $10 for adults, from 9:00 a.m. to 3:00 p.m. on Saturday; while early buyers are welcome Friday evening at 6:00 p.m. and also Saturday morning at 7:00 a.m. for $20 per person each day. Parking is free and children under 12 will be admitted for free, accompanied by a paying adult. Exhibit space is currently available; however, exhibitors are encouraged to sign up soon as spaces are very limited. Anyone wishing to reserve a hotel room should contact the Hilton Stamford Hotel & Executive Meeting Center, the official hotel of the American Antique Toy & Coin-Op Show. The hotel is conveniently located just 1.4 miles, 4 minutes from the Civic Center. Mention the show to receive a special room rate of just $79 per night (promo code: AMA). The hotel can be reached by visiting their website www.hiltonstamfordhotel.com or calling them directly at (203) 967-2222.